Happy 2018 – Day 80 – Afraid? Take action! If you’re familiar with Cognitive Behaviour Therapy (or not), you might have heard the term ‘exposure therapy’ before. If you’re unaware, it’s a form of psychological treatment, developed to support people in confront and overcome their fears. Rather than avoiding their fears, which provides comfort and safety in the short-term but worsens fear and anxiety in the long-term, individuals are ‘exposed’ to the things that they fear and avoid. There are different styles and approaches to this depending on the patient’s specific needs, phobia and situation. Some people use the ‘flooding’ approach, whereby they are exposed to their worst fears from the beginning. Go big, go home. Personally, I’m a much bigger fan of the graded exposure programme, whereby you work your way up a ladder of fears, gaining confidence with each action. Exposure therapy helped me tremendously when I was the grips of social anxiety and public speaking phobia, less than a decade ago. The thing is…it’s not just for people who have deep-seated fears and phobias. The basic principle of taking action and exposing yourself safely to what you’re afraid of, can support anyone in facing challenges, big or small. I recently mentioned that following a temporary lapse in sanity, I signed up to a hellish 10 mile obstacle race, taking place at the end of July. I have four months until Judgement Day and I’ve made it my business to avoid watching anything about it or learning about the events. Basically, I didn’t want to make myself afraid. 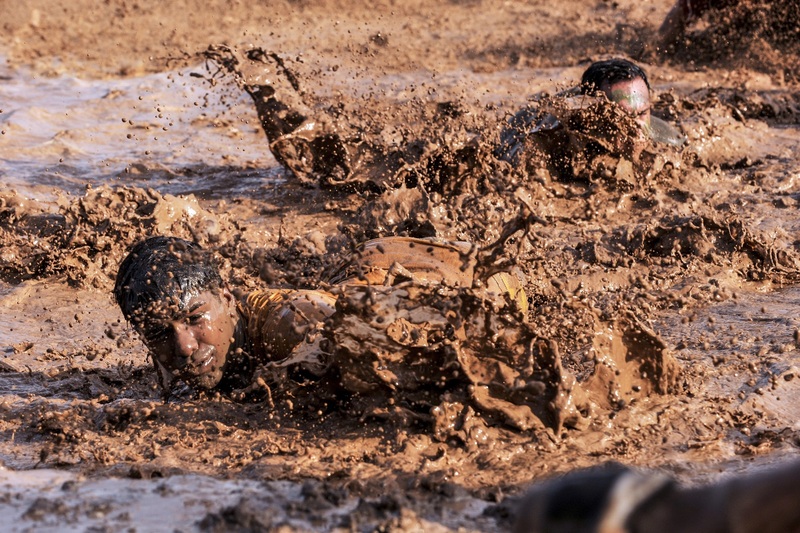 Yesterday, I watched a program on the BBC called ‘Famously unfit for Sports Relief,’ whereby a group of middle-aged, out-of-shape celebs battled through a 10 week exercise schedule, culminating in a ‘Tough Guy’ obstacle run much like the one that I’m going to be doing. Whether I watch clips or not, I’ll still have to face these obstacles. Only if I avoid learning about it, I won’t be able to prepare. If I learn about what I’m facing and put together a training plan that incorporates graded exposure, stepping up challenges week-by-week in line with both my physical and mental capabilities, then I know I’ll be much more confident on the day itself. If I’ve learnt one thing over the past decade, it’s that I don’t cope especially well with surprises. I’m also afraid of pretty much everything. So at least I have lots to work with! Even as someone who could shout from the rooftops about the greatness of facing fears, my natural reaction to life’s obstacle courses is the close my eyes and hope for it to go away. It’s really useful when in these situations to remind myself that it isn’t going away. And so the only answer is: get ready. Take action! Have you tried exposure therapy? Are you already a pro at facing life’s challenges and traumas? Thoughts and comments welcome.